Home/ Maritime Standard Awards Winner! Fichte & Co Legal Consultancy is proud to announce that Managing Partner Jasamin Fichte was conferred the “Maritime Standard Woman in Shipping Award” by The Maritime Standard Awards held on Monday, the 9th of November 2015 at the Atlantis The Palm. 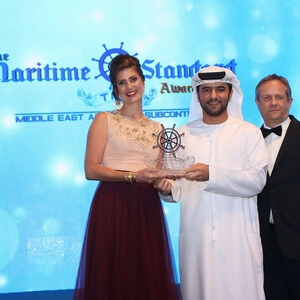 Attended by 800 guests, including high profile personalities and the who-is-who of the Middle East’s shipping industry, the 2nd Maritime Standards Awards have been held to acknowledge and celebrate the successes and achievements of outstanding key personalities and decision makers in the market. “The UAE’s maritime and shipping industry has witnessed major advancements throughout the years, with plenty of potential remaining to be tapped into. Being acknowledged for our efforts both professionally and individually re-assures me in our emphasis on spearheading the achievement of excellence in a sector that requires constant adaptability”. Jasmin dedicated the award to her fellow WISTA members and thanked the Dubai Government and especially DP world for their constant endeavors to support women in the industry. Since its inception in 2005, Jasamin has successfully steered Fichte & Co to host the largest regional shipping team by uniquely combining regional best practice with international quality standards, thus achieving several landmark judgments revolutionizing legal practice in the UAE. Aside from her involvement in Fichte & Co, Jasamin also heads the UAE’s chapter of WISTA, an association for women in the maritime & shipping industry.